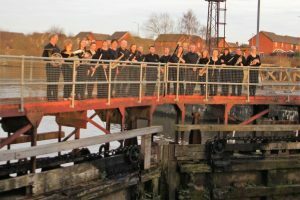 On 2nd June the new musical work named Latchford Locks will be premiered by the North Cheshire Wind Orchestra (NCWO) at the Sir Thomas Boteler Church of England High School, Latchford, Warrington. Latchford Locks is the 2nd in a series of works inspired by the Manchester Ship Canal and commissioned by the NCWO. The work starts with a simple theme for the People’s Canal, as it was originally known, which evokes the misty and murky waters of the canal. Through a series of variations Gary brings to life different aspects of the canal from the Boggy Stream and the Stoney Sluices to the Goddess of Fruitfulness (the now derelict Pomona Lock) and the historic Black Bear Canal. The piece has been commissioned by the NCWO and Tracy Woods and is dedicated to Bridget Smith. Bridget was a great lover of the clarinet and had performed with the orchestra for over 30 years until she recently lost her battle with cancer. Bridget had a wonderful life and brought joy to children and adults around the world through her work in the animation industry. Bridget worked for Makinnon and Saunders for over 30 years and worked on programmes such as Bob the Builder, Postman Pat and films including Mars Attacks and The Corpse Bride as well as a number of TV commercials over the years. 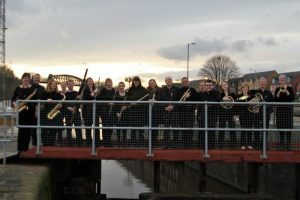 The Sir Thomas Boteler Church of England High School is nationally recognised for the provision of music and are committed to providing opportunities for students to experience different kinds of music. The Sir Thomas Boteler Church of England High School is pleased to be working with the NCWO on this exciting project.